Born in Engels, Saratov Region, in 1995. Sofia attended the Engels Primary School of Arts No1 (class of Marina Gagarina) and the Music School at the Moscow State College for Performing Arts named after Chopin (class of an honored artist of Russia professor Ara Bogdanyan). 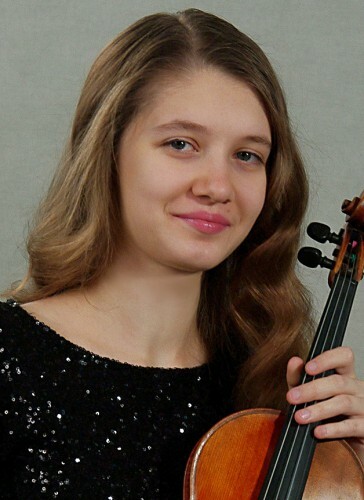 She graduated from the Moscow State College for Performing Arts in 2014 and pursued her study at the Moscow State Tchaikovsky Conservatory at a class of the same professor. 2012 - the International “The Culture of Siberia” Competition Award (Omsk). 2013 - the 2nd prize of the 5th International Sviridov Competition for Juniors (Saint-Petersburg). 2015 - the International “Open Europe” Competition Award, winner of the 23d International “Music and Earth” Competition (Bulgaria). 2016 - the 9th International Lutraki Competiton Award (Greece). 2017 - winner of the International SibeliusFest Competition for instrumental music(Turku, Finland). Sofia is giving performances at many festivals in Russia and abroad. She participates at “New Names” Foundation programms, workshops by Sergei Kravchenko, Evgenia Chugaeva, Valentina Yakubovskaya, Tatyana Samuil, Roland Baldini. She was awarded the Moscow City Department of Culture Fellowship. She plays with Unda Maris band (Moscow).